The Preservation Fund is working to protect offshore islets in the Grenadines that are Important Bird Areas. In particular the islands of Petit Canouan, All Awash and Battowia are important wildlife reserves and home to thousands of resident birds and migratory birds. Seabirds that nest in these islands include the magnificent frigate bird, the Roseate tern, and the red-footy booby. These birds face many threats including poaching of sea bird eggs. The SVGPF is working together with the Government to put in place mechanisms to enforce the protection of these wildlife reserves, where the bird populations are facing serious decline. 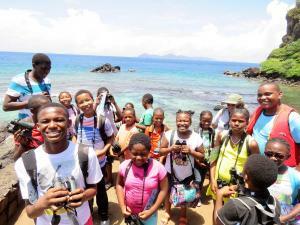 Photo below shows children who took part in summer wildlife program of the organisation “Science” led by naturalist Lystra Culzac out on a bird watching tour. Educational awareness on the environment is a key component of many of the SVGPF programs.